We have seen a few instances where TMWSuite users will be missing Jurisdiction location information in their data files. There are a few ways in which TMWSuite users can update their information for stops and cities that are showing blank Jurisdiction values. Entries in both the Fuel Truck Stops and the database’s City table should have jurisdiction information. If possible, it is best to update both. Keeping both sections accurate best protects against further missing values or unmatched values in the future. In addition to information stored within the Cities section of File Maintenance, information is stored at an individual stop level within TMW Fuel Maintenance. To best ensure that records of fuel purchases have City, State, and Zip Code information, Fuel Stop information should be as accurate as possible. 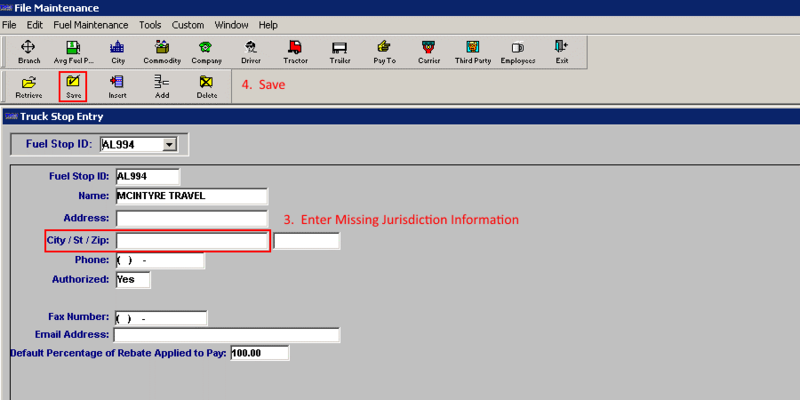 If the user knows a Station ID that is missing jurisdiction information, it can be accessed and updated by executing the following steps. This will ensure that fuel purchases made at the given Fuel Stop will have proper jurisdiction information attached. This will pull all records within TMW’s City table that do not have City Name, State, or Zip Code information attached. From there, the information can either be updated within the database, or the city can be updated from within TMW’s File Maintenance. This will ensure that any time a city’s information is used by TMW, its jurisdiction information is accurate.